Doesn’t the title just sound like heaven in a bowl? 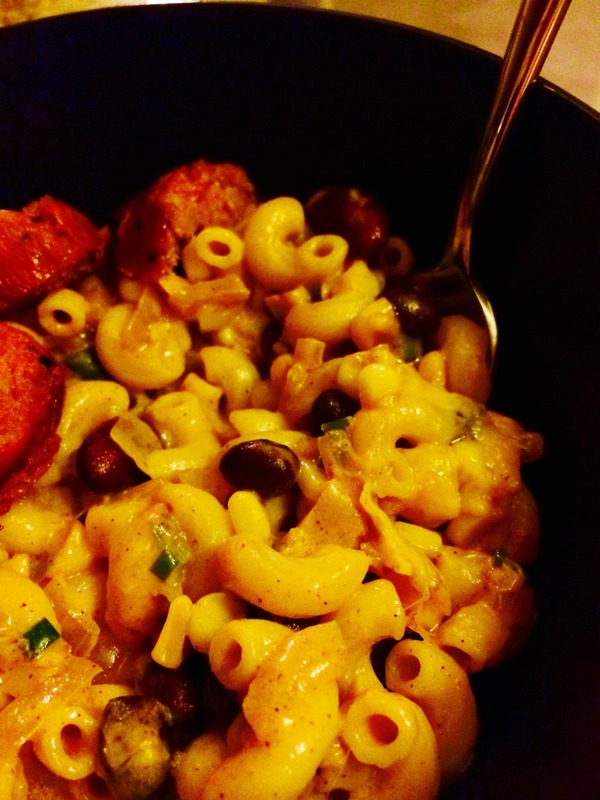 What’s better than some tasty chili or a creamy bowl of mac and cheese? How about both put together! This week, Britt and I decided to cook dinner for the family (although for a number of reasons, I ended up cooking with my sous chef, Freddy Lamb Lowenstein, who was essential in the tasting part of the process). We thumbed through the newest Mollie Katzen book and stumbled upon a series of mac and cheese recipes. 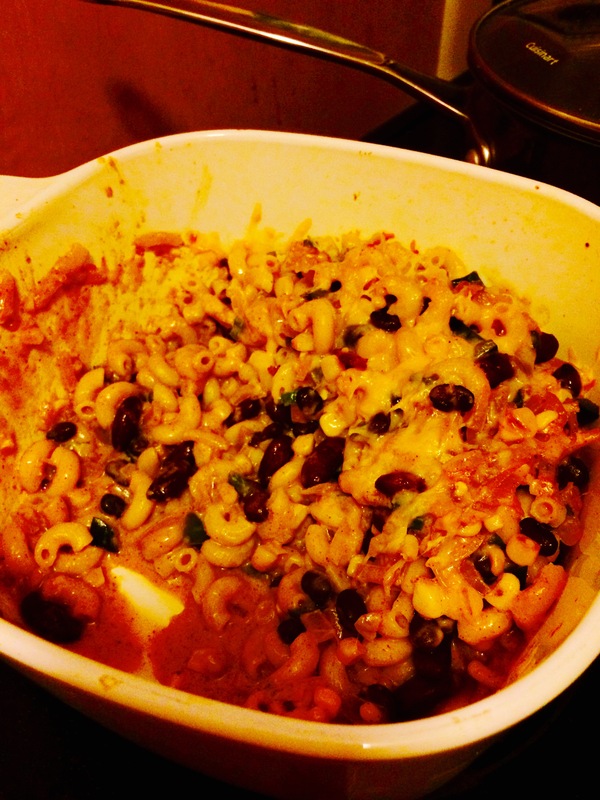 One was called chili mac and cheese, and seemed like the perfect combination of protein and deliciousness. The following recipe is adapted from The Heart Of The Plate. I wasn’t cooking in my own kitchen, so the pictures are all Instagrammed. They should convey the amazingness. 1. Boil water and cook the pasta until just al dente (I used the lower range of cooking time on the box). Drain the pasta, toss with a little olive oil to keep from sticking and set aside. 3. Prep the ingredients: Get all of your veggies ready, and grate your cheese. Put the onions in one bowl. Put the garlic, chili peppers, scallion, corn and spices (excluding salt) in another bowl. Measure out your flour. Microwave your milk until hot and steaming. Mine took about 4 minutes. 4. Add two tablespoons olive oil to a large pot (I used the one we cooked the pasta in). Add the onion and cook over medium heat until softened, about 3 minutes. Add the veggie/spice bowl of stuff and cook for another 5 minutes or so, until the veggies soften. 5. Turn the heat to low, add the flour and stir until you get a paste, about 15 seconds. Drizzle in the hot milk, stirring constantly. Continue stirring the mixture until it thickens, about 2-3 minutes. 6. Add half of the cheddar and 3/4 cup of the Parmesan to the milk mixture. Stir until the cheese is melted and smooth. 7. Remove the cheese mixture from the heat, and gently stir in the pasta. Add the beans and salt, and stir just to combine. 8. Pour the pasta into the prepared baking dish and top with the remaining shredded cheddar and Parmesan. 9. Bake for about 15-20 minutes until hot and bubbly. You can finish it under the broiler for a minute or two if you want it a little crispy on top. Serve immediately. (We had ours with Italian turkey sausages for the meat eaters, sliced into pieces and sprinkled on top, and it was delicious.) The pasta will serve 4-6 for a full meal. 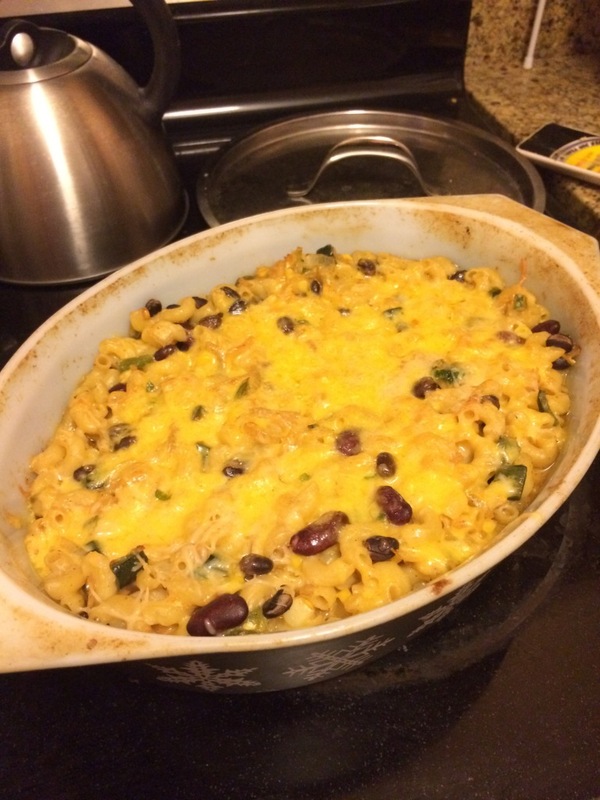 This entry was posted in Mains, Sides and tagged Beans, CHEESE, corn, Italian Foods, Mexican foods, Pasta, Vegetarian. Bookmark the permalink.